At yesterday morning's Hello Again keynote event, Apple announced the long-awaited update to their professional laptop line. The new MacBook Pro comes in two sizes and features a thinner body and upgraded internals. It also comes equipped with Apple's brand new Touch Bar, a Retina touchscreen display which replaces the row of function keys atop the keyboard, and a Touch ID sensor. These new machines mark the first significant spec advancements for the MacBook Pro since they moved to Haswell processors in 2014, and the first notable hardware changes since going Retina in 2012. As such, it's no surprise that the new MacBook Pro is an improvement in nearly every way over previous models. This is truly the next generation of Apple's flagship laptops. Apple's new Touch Bar is a slim multitouch display located above the keyboard where the function keys used to be. At 2070px wide by 60px high (equivalent to 1085pt by 30pt), the display has Apple's official blessing as "Retina". The Touch Bar provides a programmable interface which developers can take advantage of to expose controls specific to their apps directly on the keyboard. When developers are not controlling the display, Touch Bar will show a system interface of buttons and controls which users can customize to their liking from System Preferences. The beauty of the Touch Bar is this: by placing the display directly on the keyboard, the controls are located in the most convenient place possible for laptop users. What has always bothered me about the shift toward Windows laptops with touchscreen displays (and, for that matter, using an iPad with a keyboard), is that you constantly have to lift your entire arm and stab at the screen. It's imprecise and tiring over time, and in general just not the best experience. Of course, it very much remains to be seen whether the Touch Bar is truly a better solution for bringing the power of multitouch displays to the laptop paradigm, but on paper it certainly seems like an idea with great potential. To demonstrate this, Apple demoed several apps on stage which already make use of the new Touch Bar. Final Cut Pro will show an interactive display of an active project's timeline in the Touch Bar. Swiping across this timeline allows for quick navigation through the project, and buttons on either side of it may provide other functions depending on what you're doing in the app. Another demo was from an Adobe employee, and showed off the way an upcoming update to Photoshop will allow interaction through the Touch Bar. In this case, the touch interface allowed for quick changing of brush size with one hand as the other hand used the trackpad to edit a photo. Microsoft has also announced an update to its Office suite to work with the Touch Bar. The Word update enables a mode where everything is hidden other than the document and the toolbars are relocated into the Touch Bar. The PowerPoint update is geared toward making graphics manipulation easier by changing layer positions and rotating objects with slides of a finger across the Touch Bar. Excel moves function suggestions and other common tools down to the keyboard layer. Microsoft's take on this strikes me as the most common approach we'll see from developers, but I'll be interested to watch trends as more apps release Touch Bar support. Will they all just converge around the same tropes, or are there more innovative uses for the new interface that Apple hasn't yet thought of? One of the uses of the Touch Bar that I'm most excited about is using it as an emoji picker. The current macOS emoji picker is slow to load and only lets me use one emoji at a time before being automatically dismissed (yes, I know I can drag it away to keep it open permanently, but I don't want that either). To open up a nice view of emoji right on the Touch Bar and be able to use as many as I want to before dismissing them will be great. On the far right side of the Touch Bar is a small black square which is not part of the display. This square is the new MacBook Touch ID sensor. The sensor, which is actually a clickable button, has three main functions at this time. First off is the obvious: the new MacBook Pro can be unlocked using the Touch ID sensor instead of having to type in your password. I'm sure this will be a much faster and more reliable method of auto unlock than the Apple Watch Unlock method introduced with macOS Sierra earlier this year. The second function of the Touch ID button is making a payment with Apple Pay in Safari. This feature was made available in macOS Sierra by kicking the payment to an iPhone with Touch ID to authenticate it. Now the entire process can occur directly on the Mac. Finally, the Touch ID sensor can store and differentiate the fingerprints of different users on the computer. If one user is logged in and another comes by to use the Mac, they can simply place their finger on the Touch ID sensor and the MacBook Pro will automatically transition into their user account – no logout/login necessary. I'm sure it won't be long until the rest of the features we're used to from Touch ID on iOS (I think it's only missing native in-app payments) come to the Mac as well. With all of these great functions, Touch ID is an incredibly strong addition to the MacBook Pro. The new MacBook Pro comes in the same two sizes as before, with both a 13-inch and a 15-inch model. The 13-inch model weighs in at a mere 3 pounds, and is 14.9 mm thick. The 15-inch model is 4 pounds and 15.5 mm thick, making both machines quite a bit thinner than the 13-inch MacBook Air (which is 17 mm thick). The general exterior design of the machines has remained relatively unchanged. Despite some rumors to the contrary, the MacBook Pro has not transitioned to a tapered design akin to the MacBook Air. Rather, it just looks like a thinner version of the same MacBook Pro design that we're used to. The Pro also didn't receive the options for Gold and Rose Gold colors like the standard MacBook line, but it did get the option for Space Gray. The Retina display on the new MacBook Pro has been updated to support the wide color gamut previously seen on the iMac, 9.7-inch iPad Pro, and iPhone 7. The display also sports brighter LED backlighting and an increased contrast ratio. Drawing inspiration from the iPad Pro, the new MacBook Pro display supports a variable refresh rate, letting it conserve more energy by refreshing non-changing pixels less often. The new MacBook Pro has an all new speaker design with double the dynamic range and 58% more volume. Apple is also boasting 2.5x louder bass on the speakers. 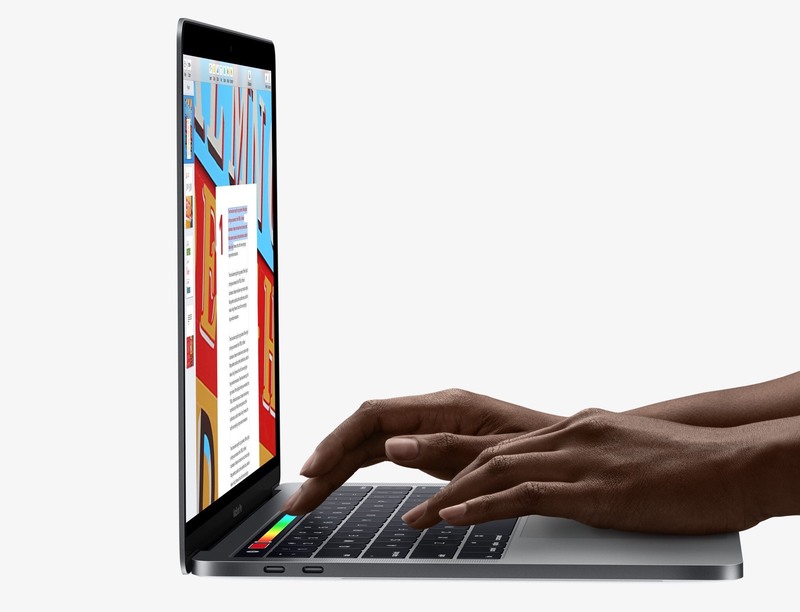 The edges of the computer to the left and right of the trackpad seem to now have speaker grills to aid in the dispersal of the improved sound. The keyboard on the new machine has been updated to include the second generation of the butterfly switches which Apple debuted on the first version of the current MacBook in 2015. The mechanism creates a uniform downward movement even when pressing keys on the edges. Apple did mention in the keynote that the MacBook Pro version has more key travel than that of the standard MacBook. The new trackpad is 2 times larger than the trackpad on the previous MacBook Pro for the 15-inch machine. It's slightly less than 2x larger for the 13-inch. Other than the increased size this is the same Force Touch trackpad that has been shipping on MacBook Pros since last year. The ports on the new machine are perhaps the greatest caveat about it. All ports that existed on the previous MacBook Pro generation (except, ironically, the headphone jack) are gone. In their place are four Thunderbolt 3 ports. Since Thunderbolt 3 uses the same connector as USB-C, these ports all function as USB-C ports as well. Sadly, this change spells the end of MagSafe on Apple's MacBook Pro line. No longer are MacBooks safe from people tripping over power cords while they are charging. On the bright side, though, the new MacBook Pros can be charged from any of the four Thunderbolt 3 ports. Thunderbolt 3 may not yet be as universal on external devices as the ports that it is replacing, but it is more capable than all of them combined. Thunderbolt 3 can connect to displays via HDMI, VGA, DisplayPort, or Thunderbolt. It can input and output power for charging, and work with any peripherals that are compatible with USB-A, and Micro or Mini USB. It's also blazingly fast and powerful with up to 40-Gbps data transfer and support for pushing up to two 5K displays. 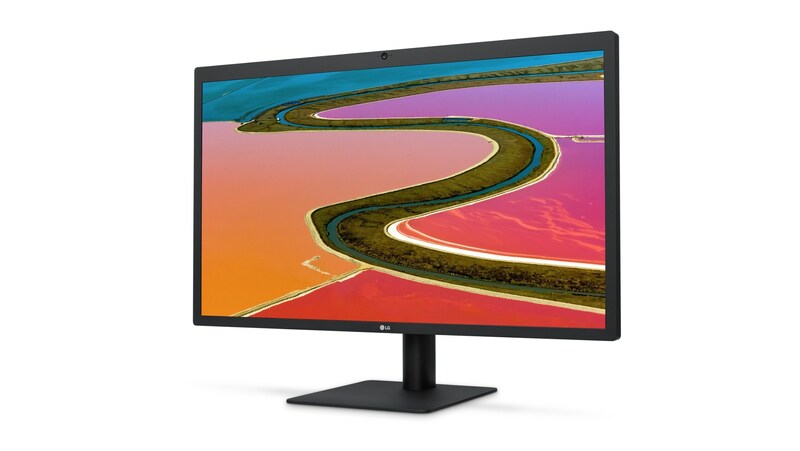 Sadly, Apple did not announce a new Apple-branded 5K display to use with these ports, but it did recommend a new LG display, which the two companies collaborated on. The new MacBook Pro massively outperforms the previous generation. The 15-inch model features a Radeon Pro discrete GPU which delivers up to 130% faster graphics. The 13-inch model packs an Intel Iris Graphics 540 with up to 103% faster graphics than the previous 13-inch model. All new MacBook Pros come with solid-state drives, the performance of which have improved to 3.1 GB/s read speeds and 2.1 GB/s write speeds (2.2 for the 15-inch). The 13-inch comes with 256 GB of storage baseline, and can be updated to up to 1 TB. The 15-inch model also comes with 256 GB baseline storage, but it includes the option to upgrade to a 2 TB SSD, the first time such a huge solid-state drive has been available on a Mac. For processors, the 13-inch model can be purchased at the baseline with a 2.9GHz dual core and 3.3GHz Turbo Boost Intel Core i5. This can be upgraded at checkout to an up to 3.3GHz dual core and 3.6GHz Turbo Boost Intel Core i7 processor. The 15-inch model can be purchased at the baseline with a 2.6GHz quad core and 3.5GHz Turbo Boost Intel Core i7. This can be upgraded at checkout to an up to 2.9GHz quad core and 3.8GHz Turbo Boost Intel Core i7. Both sizes provide 10 hours of battery life. Through this new generation of MacBook Pros, Apple has rocketed its aging flagship laptop line back to the forefront. With greatly improved performance, refreshed hardware design, and innovative additions like the Touch Bar and Touch ID, Apple is delivering what looks to be an extraordinary new line of products. The Touch Bar in particular is a possibly game-changing feature. We'll have to wait for reviews to see how well it works in practice, but the idea of putting a multitouch display directly under your fingertips on a laptop has strong potential. I can't wait to see what developers start cooking up to make use of the new interface. The last thing to talk about here is pricing. Unfortunately, Apple has increased the base prices across all models of the new MacBook Pros. The starting price of the 13-inch MacBook Pro with Touch Bar and Touch ID is $1,799, a significant increase over the starting price of the previous MacBook Pro generation, which started at $1,299. To fill this gap, Apple is also offering another 13-inch model, available at $1,499. However, this lower priced model does not include the Touch Bar, nor Touch ID. Instead, the top keyboard row is reverted back to the standard function keys that we are used to. This model also has lower powered specs than the others in the lineup. On the 15-inch side, Apple is only offering models which include the Touch Bar and Touch ID. The starting price here is $2,399. You can compare all models of Apple's new MacBook Pro lineup here. The MacBook Pro without Touch Bar or Touch ID is shipping already as of yesterday, and the MacBook Pro models with Touch Bar and Touch ID will start shipping in 2-3 weeks. You can also follow all of the MacStories coverage of today's Apple's keynote through our October 27 Keynote hub , or subscribe to the dedicated October 27 Keynote RSS feed.